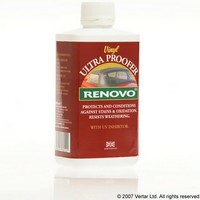 Renovo Vinyl Protector (500ml) conditions, protects and prolongs the life of all vinyl and vinyl coated fabric tops. Vinyl Ultra Proofer forms a UV barrier that helps prevent premature fading of vinyl and acts as a shield against the ravages of dirt, stains, tree sap and bird droppings. Clean the top thoroughly with Vinyl Soft Top Cleaner and allow the top to completely dry. Pour the Vinyl Top Ultra Proofer into a suitable container. Then use a 2" wide nylon paint brush, disposable foam brush or foam paint roller to apply a thin even coat over the entire surface. Immediately remove any drips on paint, glass or trim with a wet cloth. Allow to dry for 2-3 hours before folding the top. Do not use on fabric tops. A 500 ml bottle will normally cover the average top with one coat. Used on the vinyl top of my 1935 Austin Ten. This had been unused for 25 years and was in a right state, though warm water and shoe polish had made it waterproof again and acceptable. After cleaning with Renovo cleaner - initially the Protector felt like I was putting water only on the surface and didn't look very impressive. Not too bad once it dried so a second coat applied and top really began to look good. Two more very thin coats (I still have 80% of the product remaining !) - and it really looks almost "as new". Vinyl is impervious so very little of the product is needed, I found a small sponge ideal. Well recommended - go to the experts. "Thank you very much for the speedy and excellent service. The products are fine and your job fantastic the best !!!"